A prasadam made with coarse rice,to Lord Vigneswara, especially on Vinayaka Chavithi,in the month of Bhadrapada masam.A unique festival which all children participate and celebrate with their parents. The easiest prasadam to do.The measurements i give will be very lessmostly sufficient for a person,you can make double if u want to. Place a kadai on the stove add 2 1/2 cups of water,and 2tsp of oil,salt and soaked channa daal and let it boil.After it boils,then reduce the stove flame to low and now slowly add the biyyam nuka slowly,stirring well.Add the total 1 cup of biyyam nuka,and place a lid and let it simmer,occasionally stirring. After it gets cooked,switch off the stove let it remain aside and let it cool. After it gets cool, now make balls,and place the undrallu in an idli stand,and cook just as you cook idli(cooking is done on water vapour). Switch off the stove after 5 mins. 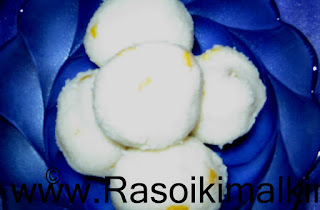 Even though it can be eaten after the balls are made,no need of cooking like idli.Thats why 2 1/2 cups of water are added.But some people add only 2 cups of water instead of 2 1/2 cups,and after making balls they cook them as they cook for idlis .Depends .